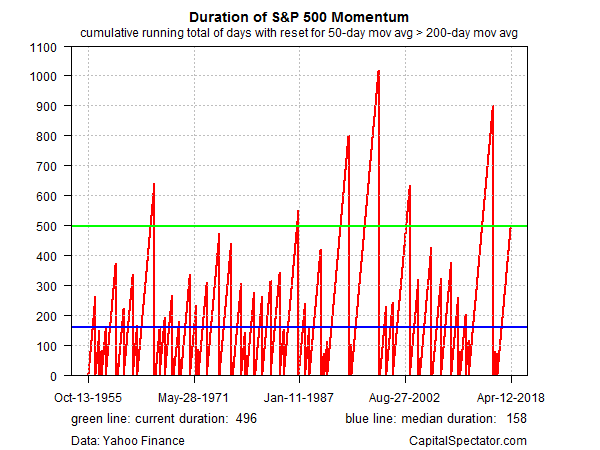 How Long Will The Stock Market’s Momentum Party Last? Is a death cross near? Yes, according to David Rosenberg, chief economist and strategist at Gluskin Sheff. Citing a laundry list of reasons for this year’s revival in market volatility, he told CNBC this week that the S&P 500’s 50-day average may soon slip below its 200-day average – a so-called death cross that market technicians say would signal a bearish shift for the market outlook. Perhaps, although Tom McClellan of the McClellan Market Report noted a number of years ago that the track record for investing based on death crosses is mixed. In August 2011, for example, the S&P’s 50-day average slumped below the 200-day average, but that death cross turned out to be a buying opportunity: by October 2011, the market was rebounding – a rally that continued without a major setback until August 2015. O death, where is thy sting? The next time could be difference, of course. Meantime, in the here and now, the S&P’s 50-day average continues to hold above its 200-day counterpart, through yesterday’s close (April 12). This year’s turbulence has trimmed that bullish spread, and the 50-day average is now trending down, but we’re still a ways off from a new death cross signal. The current run of the 50-day average holding above the 200-day average ranks as the seventh-longest bull regime since the mid-1950s. That’s a reminder that while the current phase of positive momentum – 496 consecutive trading days and counting for the S&P’s 50-day average above its 200-day average – is lengthy, it’s far from a record in the modern era. That milestone was set with a 1,020-day monster rally that ran through Sep. 1998. When and if the 50-day average falls below the 200-day average, as it one day will, the case for bullish optimism will suffer. There’s nothing magical about 50 and 200 day averages, of course. We could just as easily focus on, say, 61- and 197-day averages and suffer no less authority on matters of the market’s technical profile. But the fact that the 50- and 200-day averages are widely followed suggests that a death cross by this definition could resonate on a deeper level with the crowd when it strikes. Stocks Slammed Into Red For 2018: Powell Plunge, Dudley Dump, Or Trump Turmoil?